At the Latin Lawyer 2019 Awards charity event held in São Paulo on April 10th, our firm, which was nominated for Latin Lawyer Deal of the Year Awards in the Private M&A and Private Equity categories, received the Deal of the Year – Private Equity Award for the work we did in connection with the Union Acquisition-Bioceres exchange transaction. We are pleased to announce that José María Aballone, Corina Laudato and Matías Olcese, have been appointed as partners of the firm effective as of January 1st, 2019. Find full information of the announcement in the following link. On December 28, 2018, the Financial Information Unit's ("UIF") Resolutions No. 154/2018, 155/2018 and 156/2018 were published in the Official Gazette. Notwithstanding the approval of "UIF's Supervisory procedure based on risks", which shall apply to control procedures initiated after the effective date thereof, and the incorporation of the "Regulation of the National Securities Commission's (Comisión Nacional de Valores) collaboration duty for the supervisory procedures of the reporting parties under its comptroller", the "Regulation of Superintendencia de Seguros de la Nación´s collaboration duty for the supervision procedures of the reporting parties under its comptroller" and "Rules of National Associativism and Social Economy Institution's (Instituto Nacional de Asociativismo y Economía Social) duty of collaboration for supervision of regulated entities under its comptroller" reflected under Resolution No. 155/2018, the amendments introduced by Resolution No. 154/2018 to Resolutions UIF No. 70/2011 , UIF No. 67/2017, UIF No. 30/2017, UIF No. 21/2018, UIF No. 28/2018 and UIF No. 50/2011 are of special interest. On December 7, 2018, Resolution 159/2018 was published in the Official Gazette, whereby the Agency for Access to Public Information passed the "Guidelines and Basic Contents of Binding Corporate Rules". The purpose of the guidelines is to set minimum content that must be considered for the design of binding corporate rules regarding the international transfer of personal data between companies of the same economic group. They must be binding and enforceable for the members of the economic group, employees, subcontractors and third-party beneficiaries. ("the Guide"). "The main goal of the Guide is to set the boundaries between the constitutional right to associate and the duty to avoid practices that may damage competition", sustained Mr. Esteban Greco, President of the National Commission. On December 11, 2018, the National Commission for the Defense of Competition published a guide aimed at trade associations, business chambers and professional associations ("the Guide"). "The main goal of the Guide is to set the boundaries between the constitutional right to associate and the duty to avoid practices that may damage competition", sustained Mr. Esteban Greco, President of the National Commission. In the exercise of its functions, entrusted by Decree 277/18, the Anti-Corruption Office approved by means of Resolution 27/2018 (published in the Official Gazette on October 4, 2018) the "Guidelines for the best compliance with the provisions set forth in Sections 22 and 23 of Act 27,401 on Criminal Liability of Legal Entities" ("Guidelines") aimed at providing guidance to legal entities, governmental agencies, members of the judiciary and the professional community". Mariela I. Melhem, partner and member of the Corporate and Mergers & Acquisitions and Compliance and Corporate Crime practices at Mitrani, Caballero & Ruiz Moreno, wrote the chapter titled “New Corporate Criminal Liability Act – how to protect your organisation” which was featured in “The Investigations Review of the Americas 2019” published by Global Investigations Review. On January 2nd, Law Number 27,429 was published in the Official Gazette. The new law implements the Tax Agreement signed on November 16th, 2017 between the Argentine National Government, the Governments of the Argentine provinces (with the exception of San Luis) and the Autonomous City of Buenos Aires. Click here to view the full report (in Spanish). On January 10th, Abogados.com.ar featured an article written by Ana Clara Gómez Casadei (senior associate of the firm’s Labor and Social Security practice), titled “Modificaciones al régimen de aportes y contribuciones patronales incluidas en el proyecto de reforma tributaria". Argentina's tax reform bill was finally enacted into law on December 27, 2017. The new law was promulgated on December 28 and published in the official gazette on December 29, 2017. The new law introduced a comprehensive tax reform encompassing federal taxes such as corporate income tax, personal income tax, value added tax (VAT), excise taxes and fuel taxes. Click here to a complete report. On December 20th, the firm hosted a toy paint and assembly workshop. The toys were given to children on Christmas Eve by NGO Fundación Sí. Buenos Aires’s Official Gazette published on December 7th, Resolution number 3024/SSTIYC/17 which establishes the extension of the deadline for employers with legal address or commercial establishments located in the City of Buenos Aires that employ up to ten (10) employees, to enroll in the Online Employers’ Registry. On December 6th, Julio Caballero (partner of our Labor and Social Security Law practice) and Daniel Stortini (Judge in the National Labor Court of Appeal) were speakers in the open class presenting the LL.M in Labor Law, which is due to start in 2018 at UCES University. We are pleased to announce that on December 5th, Latin Lawyer published an article titled “Argentina targets corruption with corporate criminal liability law”, which includes extracts of an interview made to Cristian Mitrani (partner of the firm’s Corporate practice). Nicolás Fernández Madero was a participant in the debate on negotiable debt securities in the new Capital Markets Law, organized by Cámara Argentina de Fideicomisos y Fondos de Inversión Directa en Actividades Productivas – CAFIDAP, carried out in the Buenos Aires Stock Exchange Market on November 28th. Members of the Argentinean Ministry of Finance, which promoted the new law, also participated in the event. The show Noticias RSE, presented by Mercedes Occhi and Sara Beatriz Jumilla Rubin, broadcasted by "Radio Amadeus Cultura Musical FM 91.1”, interviewed Mercedes Rodríguez Giavarini, partner of our Corporate Practice and responsible for the CSR Committee. On November 15th, Ana Clara Gómez Casadei (associate of our Labor and Social Security practice) was an invited speaker at the 18th event on Corporate Tax Planning, organized by FORUM – Foros y Conferencias. She spoke about the changes brought on by the latest legislative reforms on social security contribution. Latin Lawyer, Abogados.com.ar and LexLatin published articles which describe the firm’s internal reorganization of its Intellectual Property practice, announce the incorporation of new members to the firm, and include comments made by Cristian Mitrani and Diego Parise. View Latin Lawyer’s article (here), Abogados.com.ar’s article (here), and LexLatin’s article (here). Rita Colombo and Agustina Ávila, members of the firm’s Intellectual Property practice, gave a lecture at Universidad de Palermo on the legal aspects of videogames. It was a dynamic workshop with a theoretical and practical approach on the importance of intellectual property protection within the videogame industry, which is growing in popularity. On September 19, ANSeS’s Resolution N° 175-E/2017 was published in Argentina’s Official Gazette. This resolution sets at 13.32% September 2017’s mobility index to calculate categories and values of Family and Universal Allowances. View the full report here (in Spanish). Mitrani, Caballero & Ruiz Moreno advised Ternium on the acquisition of CSA- Siderúrgica do Atlântico Ltda (Thyssenkrupp’s subsidiary) and in the attainment of a USD 1.5 billion syndicated loan. The transaction was announced on February 2017 and it was completed on September 7. View Latin Lawyer’s article (here) and LexLatin’s article (here). Client alert. Simplified Joint Stock Companies. Requirements for Incorporation. As of September 1, 2017, General Inspectorate of Justice (IGJ)’s General Resolution Number 6/2017 came into force, allowing the filing for incorporating Simplified Joint Stock Companies or Simplified Shares Companies (Sociedad por Acciones Simplificadas, or SAS by its Spanish acronym) before the Public Registry, through a swift and customizable legal vehicle which combines aspects of Limited Liability Companies and Corporations. On August 30, Abogados.com.ar featured an article written by Federico Sánchez Almeyra (senior associate of the firm’s Tax practice), titled “Nulidad del revalúo bonaerense de 2013 de inmuebles en barrios cerrados y clubes de campo” (Nullity of Buenos Aires’s 2013 revaluation of properties in gated communities and country clubs). View the full article here (in Spanish). Decree N° 629/2017 (B.O. 10/08/2017) lays out new rules for the import of used goods meant to be used in the oil & gas industry, allowing their final importation when these are no older than 10 years since their manufacture. On July 21 Argentine and Brazilian authorities signed an amendment protocol that updates the treaty to avoid double taxation and prevent tax evasion, originally signed on December 7, 1982. On December 21st, Mariela I. Melhem (partner member of the Corporate, Mergers & Acquisitions and Compliance and Corporate Crime practices), gave a presentation in the Argentine Chamber of Exporters (C.E.R.A.) on “La nueva Ley de Responsabilidad Penal Empresaria y el comercio exterior. Cómo protegerse" (Act on Criminal Liability of Legal Entities and Foreign Trade. Protecting your business from liability). On December 1st, National Act 27,401, on Criminal Liability of Legal Entities for crimes committed against the public administration and transnational bribery (the "Act"), was published in the Argentine Official Gazette. The Act will enter into force on March 1st, 2018. Below, you will find an overview with the main highlights of the law and the aspects of special interest for local and foreign companies. On November 8, 2017, National Congress passed an Act addressing Criminal Liability of Legal Entities for crimes committed against the public administration and transnational bribery. The Act will enter into force on the 90th day following its publication in the Argentine Official Gazette. Carlos Trogolo Eliçabe (Corporate), Magdalena Magnasco (Tax), Ana Clara Gómez Casadei (Labor and Social Security) and Cecilia Brunelli (Labor and Social Security) gave the third module of the workshop El ABC Legal para tu emprendimiento, on corporate, tax and labor matters. On November 14th, our firm hosted the second module of the workshop El ABC Legal para tu emprendimiento, in collaboration with Inicia - Comunidad de Emprendedores. 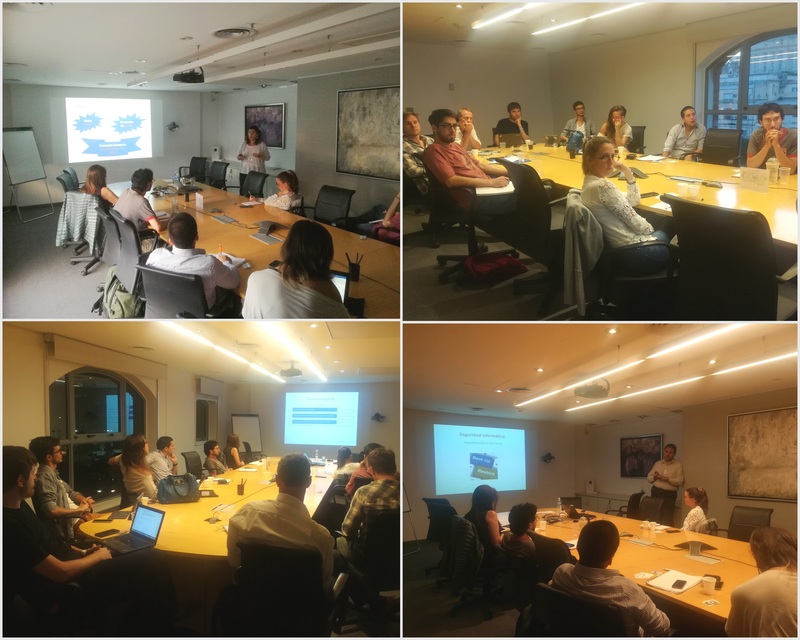 Rita Colombo (senior associate within our Intellectual Property practice) and Eduardo Ramallo (IT Manager) gave a training course on copyright, contracts, cloud computing and computer security. Photographs of the event can be seen here. Mitrani, Caballero & Ruiz Moreno strengthens its Energy & Natural Resources and Infrastructure practices and reorganizes its IP practice. Latin Lawyer published the article Strength in Numbers, which includes fragments of an interview made to Ignacio Bérèterbide, partner within the Intellectual Property practice at the firm. Recently, the Supervisory Board of Companies ("IGJ" after its acronym in Spanish) issued General Resolution 05/2017, which modifies General Resolution 07/2015 and establishes a differentiated treatment for the registration of Limited Liability Companies ("SRL"). Also recently, the IGJ issued General Resolution 06/2017 by which the registry regime for Simplified Business Corporations ("SAS") was adopted. Finally, on July 20th, 2017, the Comisión Nacional de Valores (Argentine National Securities Commission) issued General Resolution N° 700, in which the draft regulation to implement the crowdfunding platform contemplated in the law on Support for Entrepreneurial Activity is published and invites interested parties and regular citizens to present views and proposals within the framework of the procedure of "Participatory elaboration of Rules & Regulations". Mariela I. Melhem, partner and member of the Corporate and Mergers & Acquisitions and Compliance and Corporate Crime practices at Mitrani, Caballero & Ruiz Moreno, wrote the chapter titled “Argentina: current anti-corruption landscape” which was featured in “The Investigations Review of the Americas 2018” published by Global Investigations Review. On August 10, 2017, the Office of the Superintendent of Risks at Work (SRT for its Spanish acronym) published in the Official Gazette, SRT resolution No. 844/17, which replaces the text contained in Annex 1 (list of agents, mixtures and exposure circumstances which are carcinogenic) of SRT resolution no. 415/2002. View the full report (in spanish) here. Mariel Chichisola, María Paula Giannetti, María Luz Nuñez and Adeline De Montmarin (members of the firm’s Intellectual Property practice) gave a talk titled "Legal ABC for your Enterprise" at Universidad de Palermo, on August 9, 2017. On August 9th, the Argentine tax authorities issued General Regulation (AFIP) N° 4101-E implementing the procedure for applying for the expedited VAT reimbursement or credit against any other national tax relating to the purchase, production or import of new fixed assets or infrastructure works performed within the framework of the Promotional Regime on Renewable Energy Sources, created by Law 26,190 amended by Law 27,191 (the "Regime"). The Argentine tax authorities (AFIP) issued General Resolution 4099-E (B.O. 28/07/2017), establishing a new regime to facilitate payments of tax and social security debts, withholdings and perceptions and their respective interests, due between 1/6/2016 and 5/31/2017. The plan will be effective between 1/8/2017 and 10/31/2017. The Argentine tax authorities (AFIP) issued General Resolution No. 4083-E / 2017 (B.O. 06/30/17), revoking the general and optional provisions of minimum presumed income tax (MPIT). Nicolás Fernández Madero, senior consultant of the firm and Coordinator of the Legal Committee of the Argentine Chamber of Productive Direct Investment Funds (CAFIDAP after its acronym in Spanish), participated in the Forum on the recently passed law 27,349 - Support for Entrepreneurial Activity, organized by the CAFIDAP, which took place on June 22nd at the Buenos Aires Stock Exchange. Mr. Fernández Madero chaired Panel 1 “Simplified Business Corporations (SAS). New corporate type aimed at entrepreneurs”, composed of the drafters of the Supervisory Board of Companies (IGJ) regulations for SAS; and discussed trusts within the entrepreneurial law in Panel 2: “New tools for the promotion of entrepreneurial capital. Tax benefits for investors. FONDCE”. We are pleased to announce that today, Latin Lawyer published an article written by Corina Laudato, head of the firm’s Tax Law Practice. The article, titled “Rising to the Challenge”, focuses on the new OECD/G20 Multilateral Convention to Implement Tax Treaty Related Measures to Prevent Base Erosion and Profit Shifting (BEPS). Mercedes Bullrich, member of the INTA Trademark Administrators Committee, was a speaker at the 139th Annual Meeting, which took place in Barcelona, Spain. The panel discussed the best ways to work and communicate with trademark professionals around the world. On June 7, Argentina and 66 other countries and jurisdictions signed the Multilateral Convention to Implement Tax Treaty Related Measures to Prevent Base Erosion and Profit Shifting ("MLI"), within the framework of the Organization for Economic Co-operation and Development ("OECD"). The newspaper El Cronista published in its legal section an article titled The World of Regional Lawyers, which includes extracts of an interview made to Diego Parise, partner in charge of the firm’s Banking and Finance practice. By means of General Instruction N° 2/2017 dated May 18th 2017, the AFIP set forth that the Minimum Notional Income Tax ("MNIT") is not applicable when financial statements reflect losses and the tax payer holds tax losses for income tax purposes for the taxable period in question. Rita Colombo, Senior Associate of our Intellectual Property Practice, has collaborated with FORES – Spanish acronym for “Forum of Studies on the Administration of Justice” – in providing a workshop on "Patents and Trade Secrets" for students of the 62nd Edition of the PEA (Spanish acronym for Lawyer Training Programme). The importance of intangible assets and the protection through intellectual and industrial property was explained in a very dynamic and friendly workshop, with theoretical and practical orientation. Special emphasis was given to patents and trade secrets, their legal treatment and protection strategies, using relevant case studies. We deeply appreciate Raúl Farías and the students of this PEA edition for their support on this valuable workshop. On April 28th, Carlos Trogolo Eliçabe (partner in our Corporate practice) and Octavio Krause (associate in our Intellectual Property Practice) gave a training course on the recent developments and benefits of the new Entrepreneurial Law. The course took place as part of the Refresher Program for instructors of Academia BA Emprende, in the Audiovisual District. Rita Colombo, Mariel Chichisola and Octavio Krause, team members of the firm’s Intellectual Property practice, collaborated with FORES – (Spanish acronym for Forum of Studies on the Administration of Justice) – by giving the “Entrepreneurship & Law to Encourage Entrepreneurial Capital” training course to students of the 62nd Edition of the PEA (Spanish acronym for Training Programme for Lawyers). Special thanks to Raúl Farías and the students for this meeting. Through General Resolution N° 4034-E (B.O. 28/04/2017), AFIP set forth a new regime regarding income tax prepayments. Click here for a complete report (in Spanish). Mitrani Caballero Ojam & Ruiz Moreno attended the “Foodie Night” hosted by Banco de Alimentos, a local food bank, on April 20. Click here to view picture of the event. 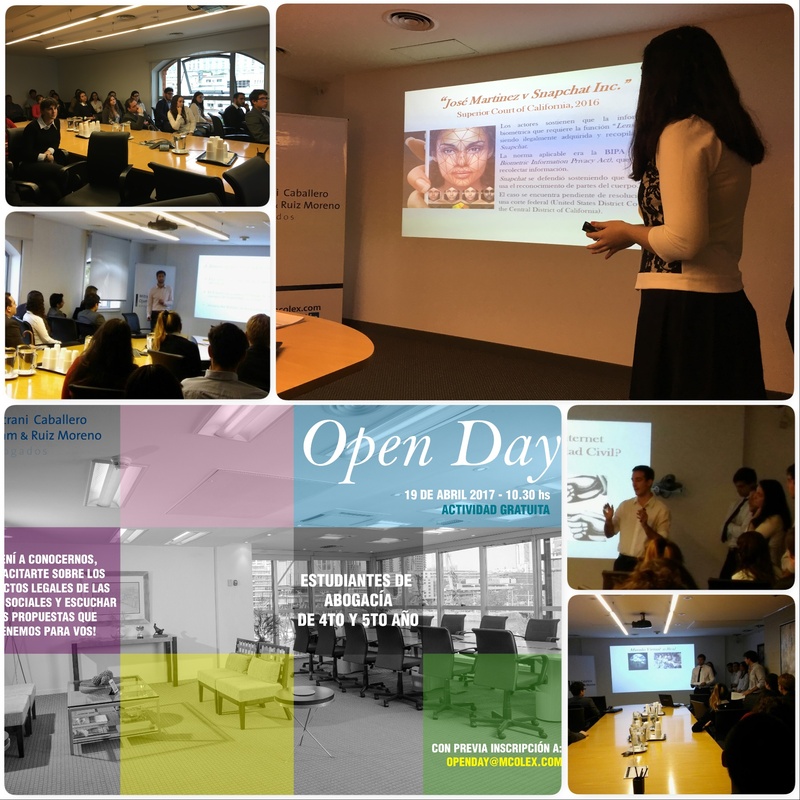 On April 19 we held the third edition of Open Day for advanced Law School students. On April 17th the Ministry of Production launched the website from which Micro, Small and Medium-sized enterprises can obtain the “MiPyMEs Certificate”, enabling them to access the tax benefits contemplated in the MiPyMES’s Program, regulated under the Law 27,264. On April 11th, the Argentine Supreme Court ruled in “Buenos Aires Police Labor Union v/ Ministry of Labor regarding Trade Union Laws”, upholding the prohibition set forth by the Province of Buenos Aires law which states that members of the Law Enforcement Department of that Province may not exercise the right to unionize. Gas y Petróleo del Neuquén S.A., the provincial company in charge of procuring the exploration and subsequent exploitation of the blocks that were reserved by the Province of Neuquén, launched Bidding Round V of exploration areas of oil and gas denominated "New Horizons Plan", and the "Neuquén Exploration Plan". Mitrani Caballero Ojam & Ruiz Moreno gave a conference on “Gestión de Ausentismo y Régimen Disciplinario. Herramientas Legales para su Tratamiento” at the Italian Chamber of Commerce in Argentina, on April, 19th. 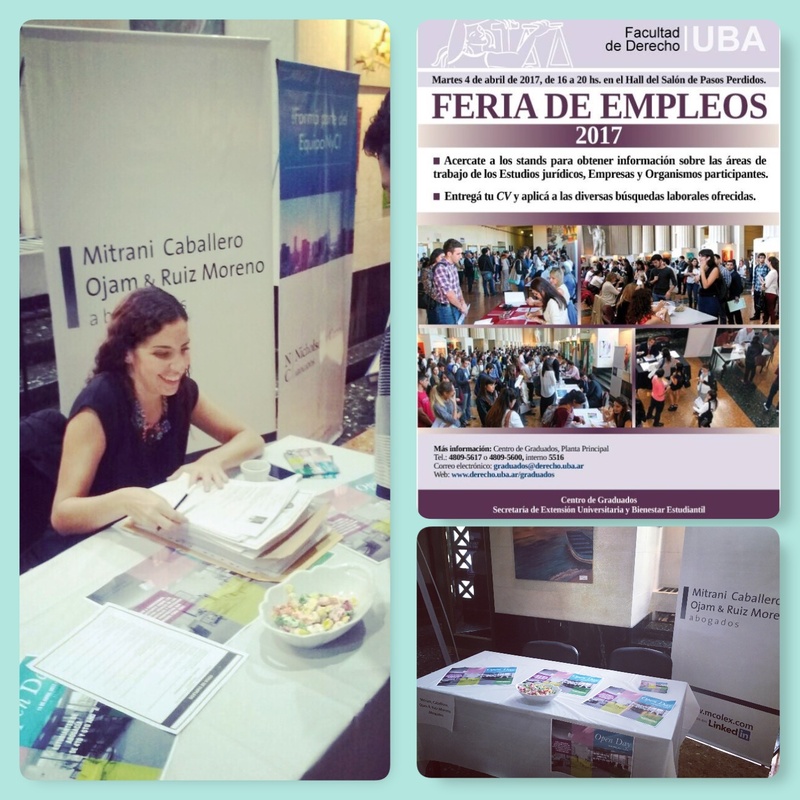 The firm was present at the Job Fair held by the Universidad de Buenos Aires on April 4. We would like to thank everyone who approached our booth! Click here to view a picture of the event. 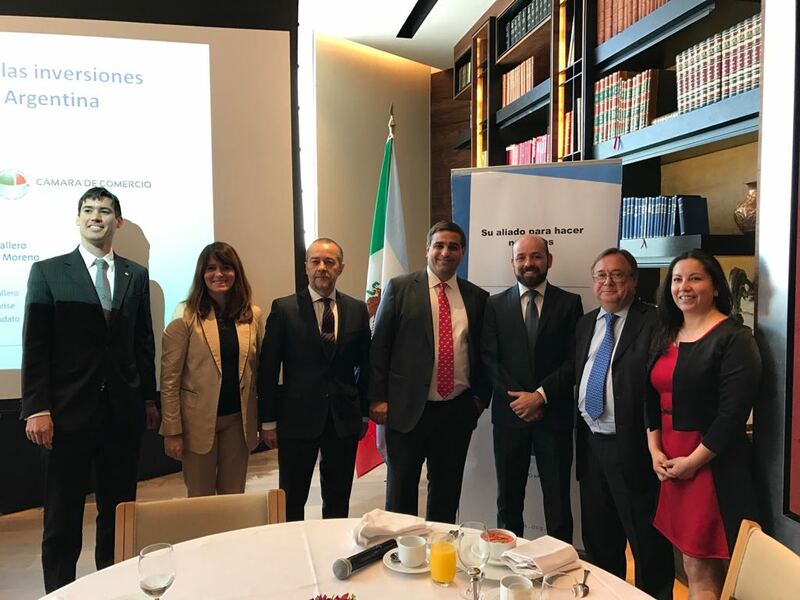 On March 29, Julio Caballero (Labor and Social Security Law practice partner), Corina Laudato (Tax Law Practice leader) and Diego Parise (Corporate Law practice partner) gave a conference on "Opportunities for Mexican Investments in Argentina” in Mexico City. The presentation, given during a breakfast hosted by the Mexican-Argentinean Chamber of Commerce and the Mexican Business Council of Foreign Trade, Investment and Technology, was attended by representatives of Mexican companies and business chambers and included the presence of the Argentine Ambassador in that country. A photograph of the event can be seen here. Resolutions SEPME N° 68-E/17 (BO 7/3/17) and AFIP N° 4010-E (BO 9/3/17) regulate the procedure, deadlines and requirements to access tax benefits for micro, small and medium-sized companies (MiPymes), regulated by Law N° 27.264. View the report (in spanish) here. Abogados.com.ar published an article authored by Jorge Pico, partner within the firm’s Labor and Social Security Law practice: “Delegados de personal. Ejercicio de las facultades disciplinarias del empleador”. We invite 4th and 5th year Law students to attend our "Open Day" to be held on April 19th at 10.30. For further information please open the attached flyer here. The activity is free but requires prior registration (limited spaces). Mitrani Caballero Ojam & Ruiz Moreno participated in the 2017 Women in the Profession (WIP) Program Annual Conference as member of its organizing committee. The event took place at the Universidad de Buenos Aires, School of Law, on 14 March 2017. The Ministry of Energy and Mining published Resolution 46-E/2017, which created a program to stimulate investments in natural gas production projects in the Neuquén Basin's unconventional reservoirs. The firm advised Ternium on the acquisition of 100% of CSA - Siderúrgica do Atlântico Ltda (Thyssenkrupp’S branch). Please access the articles published by Latin Lawyer (here) and LexLatin (here). The firm represented Ternium on CSN’s bid into Usiminas tender offer. View the header of the article here. The National Agency for the Protection of Personal Data has prepared a draft bill with the goal of replacing the current Act No. 25,326 on data protection. The firm successfully completed the first edition of its summer scholarship program. This year the participants were Lorena Emilse Tolaba, a student at the Universidad de San Andrés and Micaela María Delfino, a student at the Universidad del Salvador. Mitrani Caballero Ojam & Ruiz Moreno will reward the student of the Universidad Torcuato Di Tella who obtains the highest grade in “Labor Law” course, awarding a scholarship in our Information Center. LexLatin published an article on the role of Mitrani Caballero Ojam & Ruiz Moreno in connection with the acquisition of Texproil S.R.L. by SageRider West LLC y Sagerider Holdings Limited. An article entitled “Argentine firms target transactions with promotions” published by Latin Lawer informs on the appointment of Carlos Trogolo Eliçabe as new partner of the firm and publishes extracts of an interview with Diego Parise, who heads our Banking & Corporate Finance practice and is a member of our Corporate Law practice. The firm in articles on the sale of Tenaris’s business. LexLatin and Latin Lawyer highlighted the role of Mitrani Caballero Ojam & Ruiz Moreno on the US$335 million sale of Tenaris’s steel electric conduit business in North America to NUCOR Corporation. Access here and here to read the articles. On December 30, 2016, the Argentine Central Bank issued Communication "A" 6137 to increase flexibility of certain foreign exchange restrictions that remained in place following the changes introduced by Communication "A" 6037 in August 2016. Announcement of new partner of the firm effective January 1st, 2017. Mitrani Caballero Ojam & Ruiz Moreno announces that, effective January 1st, 2017, Mr. Carlos Trogolo Eliçabe was appointed partner of the firm. Auno Abogados magazine published an interview with Cristian Mitrani, Julio Caballero, Juan Carlos Ojam and Horacio Ruiz Moreno in their December issue. On November 16, 2016, the Argentine Congress passed new legislation on Public-Private Partnerships (PPP) aimed at promoting foreign direct investment and allowing a balanced and predictable cooperation between the public and private sectors in a wide variety of areas, including infrastructure. Click here to a complete report on the Regime. Several initiatives for the simplification of the Companies Act have been considered since the end of 2016. Finally, certain regulations applicable to "Sociedades Anónimas Unipersonales" ("SAU" by its Spanish acronym) were amended in November 2016, eliminating the requirement to appoint at least three directors and a surveillance committee. The reform responds to repeated criticisms against the excessive requirements for the SAUs, which made them an expensive and infrequently used company-type. 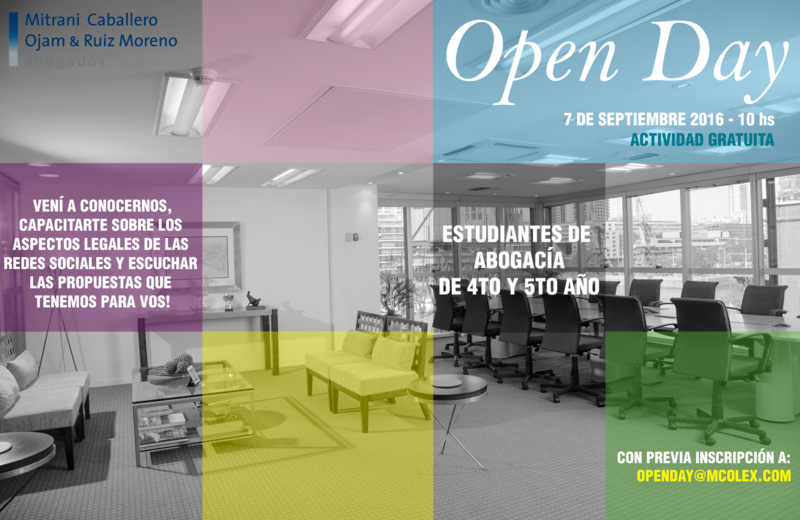 We have invited 4th and 5th year Law School students to participate from an "Open Day" on legal aspects of social networks. The event was held on September 7, 2016 (attendance was free upon registration). Partners at Mitrani Caballero Ojam & Ruiz Moreno participated in the chapter "Argentina" of the International Mediation Guide: Second Edition 2016, published by Clifford Chance. Lorenzo P. Gnecco, member of our Labor and Social Security practice, published his book "Suspension of labor contracts" (La suspensión en el contrato de trabajo), prefaced by Jorge Rodríguez Mancini. The book will be presented on June 28 at 18:30 hs at the Asociación Argentina del Derecho del Trabajo (Av. Corrientes 1145 10 "A"), with a presentation by Mario Ackerman. In the context of the activities Mitrani Caballero Ojam & Ruiz Moreno performs with INICIA | Comunidad de Emprendedores, our firm hosted the training: "The legal ABC for your venture", on June 8 and June 15. The Labor and Social Security Law Review published an article from Lorenzo Gnecco, partner in the Labor and Social Security practice at Mitrani Caballero Ojam & Ruiz Moreno, on "Changes in the socioeconomic framework and collective bargaining". Also, the Corporate LiveWire published the article "It's time for Argentina's Capital Market" on the Expert Guide "Opportunities & Developments. Latin America 2016", co-authored by Nicolás Fernández Madero, counsel in our Corporate and Commercial Law practice. TV show 300MetrosTV interviewed Mariel Chichisola, member of the Intellectual Property practice at Mitrani Caballero Ojam & Ruiz Moreno, on the relevance of protecting intellectual property rights. Rita Colombo, member of our Intellectual Property practice, lectured in FORES - Foro de Estudios sobre la Administración de Justicia - on "Author's Rights", adressed to students of the 60° Edition of the Lawyers Training Program. In a very dynamic and warm session, she explained the importance of intangible assets and their protection through intellectual and industrial property rights, focusing on author's rights and related rights and their regulation, protection strategies and applicable cases. Last March 31st, the Argentine government issued regulations [i] implementing the Promotional Regime on the Generation of Electricity from Renewable Energy Sources, created by Law 26,190 [ii], and adjusted by Law 27,190 [iii] (the "Regime"). On March 16th, 2016, Abogados.com.ar published an interview with Mercedes Rodríguez Giavarini, partner in the Corporate and Banking and Finance practices at Mitrani Caballero Ojam & Ruiz Moreno. The article describes the firm’s policies tailored to retain professional mothers. How does the firm recruit and hire talent? Jorge Pico, partner in the Labour and Social Security practice at Mitrani Caballero Ojam & Ruiz Moreno, explained to El Cronista, in an interview held on March 2nd, 2016, the means used by the firm to hire new lawyers. Julio Caballero, who heads the Labour and Social Security practice at Mitrani Caballero Ojam & Ruiz Moreno, commented on the collective bargaining regarding new salary increase agreements for 2016, during an interview held by the Legal Supplement of El Cronista on February 3rd, 2016. Latin Lawyer, Abogados.com.ar and El Cronista announced the appointment of new partners at Mitrani Caballero Ojam & Ruiz Moreno: Rita Payarola and Esteban Valansi, both part of the Labour and Social Security practice, and Soledad Vallejos Meana, member of the Administrative Law and Business Regulation practice. As in previous years, Mitrani Caballero Ojam & Ruiz Moreno took part in the assembly and collection of Christmas boxes intended for the programme to combat child malnutrition "Cuidemos la Vida y CONIN" (Let’s Take Care of Life and CONIN), by means of which underprivileged families pertaining to the town of José C. Paz are given a helping hand. On December 4th, 2015, the 21st Encuentro de Mujeres Abogadas (Encounter of Female Lawyers) was held at our offices in the context of a joint initiative of the Cyrus R. Vance Center for International Justice and the New York City Bar, with Mónica Pinto Esq. as a guest. In November 2015, Abogados In-House magazine published an interview with Jorge Pico, partner of the Labour and Social Security practice at Mitrani Caballero Ojam & Ruiz Moreno, in which he comments on the firm’s maternity policies, a proposal drawn up to strengthen families and minimize inequalities. In an article published in the Legal Supplement of El Cronista on November 4, 2015, Diego Parise, who heads the Banking & Corporate Finance practice and is a member of the Corporate Law Practice at Mitrani Caballero Ojam & Ruiz Moreno elaborates on the firm’s services to Argentine businessmen in search of business, investments or loans abroad. In an article published by the La Nación newspaper, Mariel Chichisola, member of the Intellectual Property practice at Mitrani Caballero Ojam & Ruiz Moreno comments on the role of the attorney in startups. Latin Lawyer and Abogados.com.ar announced the appointment of new partners at Mitrani Caballero Ojam & Ruiz Moreno: Mercedes Rodríguez Giavarini, member of the Corporate and Banking & Finance practices, and Juan Ignacio Soma, member of the Corporate practice.